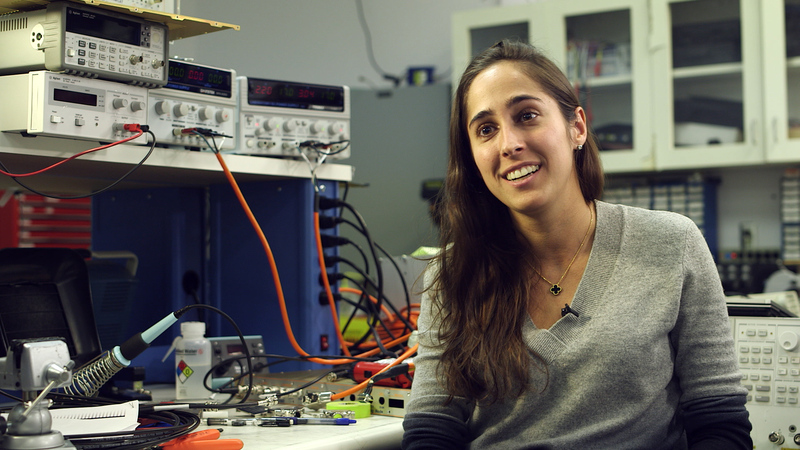 Alexa Staley is a PhD candidate at Columbia University in the City of New York, and has been working as a graduate student at the LIGO Hanford Observatory in Richland, WA. The next generation gravitational wave interferometers, known as Advanced LIGO, located in Hanford, WA and Livingston, LA have been installed and are in the process of achieving a sensitivity required for the first direct detection of a gravitational wave. The goal of their design is to measure a gravitational strain as small as 4×10–24/√Hz, requiring a length resolution of approximately 10–19 rms within a 100 Hz bandwidth. This high sensitivity demands multiple optical cavities to enhance the response of the interferometer. The interferometer is a Michelson interferometer consisting of two 4km arm cavities, whose differential length is measured by the phase change of a resonating infrared laser at the gravitational wave readout port. The Michelson interferometer is enhanced by Fabry-Perot arm cavities, a power recycling cavity, and a signal recycling cavity. The Fabry-Perot arm cavities effectively increase the arm lengths by two orders of magnitude. Meanwhile, the power recycling cavity is used to enhance the circulating power within the interferometer, and the signal recycling cavity is used to enhance the optical response at the gravitational-wave readout. Advanced LIGO has five longitudinal degrees of freedom which must be controlled in order for the interferometer to be operational. All degrees of freedom are strongly coupled. The state of the arm cavities can completely alter the state of the dual-recycled Michelson interferometer. For Advanced LIGO a new arm length stabilization technique has been implemented that is reliable and robust. The arm length stabilization technique introduces two additional green lasers that are brought into resonance in each arm cavity. This effectively decouples the arm cavity from the rest of the interferometer, and allows for the main infrared beam to be kept off resonance in the arms while it is brought into resonance in the dual-recycled interferometer. In the final step, both arm cavities are slowly tuned onto resonance and full lock is achieved. Our paper, published in Classical and Quantum Gravity, describes the arm length stabilization technique in detail and examines the noise sources introduced with the new system. The paper concludes with the steps required for achieving resonance in the full interferometer. This entry was posted in Author Insights, IOPselect and tagged Advanced LIGO, Experimental gravity, gravitational waves by BenSheard_Publisher. Bookmark the permalink.